After three British men conspired to detonate liquid explosives aboard a transatlantic flight in 2006—a plan thwarted weeks ahead of its execution—airports have cracked down on items travelers are allowed to carry through security, from bottled water to more recently introduced rules for smartphones and laptops. But a new scanner introduced at New York’s John F. Kennedy International Airport signals a future where you might be able to leave things like your MacBook and a bottle of water in your carry-on bag as you weave through security checkpoints. The TSA partnered with American Airlines to test out its new CT scanner at a security checkpoint at JFK, the airline announced on Monday. 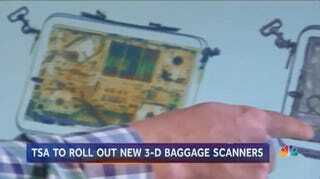 The new scanner works in three dimensions, meaning operators would have a better view of what’s inside your carry-on in contrast to the typical two-dimensional equipment deployed at security checkpoints. The CT scanner will help TSA staff “see beyond unwanted clutter” and identify restricted items, a press release from the airline states. That’s potentially great news for people who are tired of dredging up gadgets from their bags before putting them on the conveyor belt—or having to chug a soda before getting to the front of the line. “All they have succeeded in doing is creating longer queues at checkpoints where screeners are spending all of their time looking for restricted items rather than looking for genuine threats,” Philip Baum, editor of Aviation Security International, told the Telegraph in 2016 regarding the liquid restriction a decade after it was implemented. 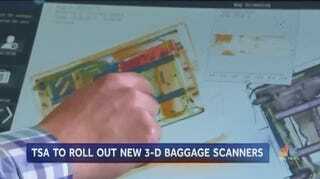 The TSA, American Airlines, and Analogic, meanwhile, seem to be angling CT scanners as the eventual solution.